Protect your business, staff and clients. 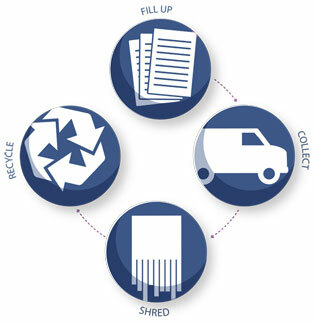 We will work with you to implement the most suitable and cost effective shredding solution for your office supplying different sizes consoles or wheelie bins with a lock and slot, or secure sacks which can be ordered along with your office supplies, online or via the telephone. Once your solution is agreed, you then fill the consoles, bins or secure sacks with the important documentation to be shredded. you don't even have to remove staples or paperclips. Depending on your organisation's security requirements, we can then either shred your documents on-site using a mobile shredding truck, or we can safely transport them to one of our secure shredding facilities with a robust audit trail. When containers are full, we will collect. You can either call us when you are ready for collection, or we can schedule a weekly, fortnightly or 4 weekly collection. Once your documents are collected, we will be able to provide you with a certificate for your records. Once your documents have been shredded, they will be taken to a secure recycling facility where the paper is then baled and then sent for recycling. Providing a shredding requires high level of expertise, so we've partnered with a leading independent on-site and off-site secure destruction service provider. Combining the strengths of being national and local,The Shredding Alliance (TSA) delivers a flexible and personal service with 12 depots across the UK. All of the companies that own or deliver services to TSA are members of the British Security Industry Association, and they go further than their competitors to ensure the highest levels of compliance to BS EN 15713:2009.